There are hundreds of different knee brace options out there and here we will help you work out what is the best for you. 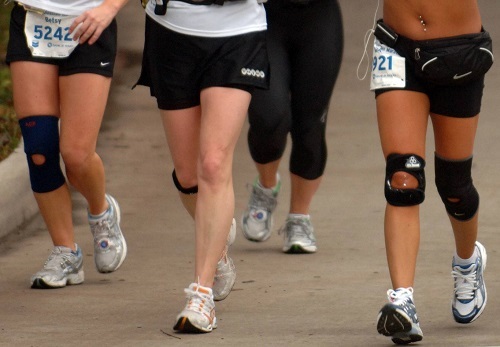 Knee braces provide different levels of support and fix to the knee in a number of different ways. They also come in different materials and vary enormously in price. There are so many different shapes, styles, manufacturers and materials that it can be hard to choose. In each section you can find a range of appropriate braces, find out how they work, what conditions they are suitable for and read reviews of each brace so you can find the best knee brace for you. Perfect for ongoing knee conditions that require a low level of support. Perfect for moderate levels of support & for reducing forces through the knee. Provide maximum stability to prevent giving way. Perfect for reducing pain & providing protection when kneeling. Adjustable with velcro straps allowing a perfect fit to your knee. Especially good if swelling comes and goes. Top of the range braces for everyday to elite athlete use. Pioneering, innovative designs. Particularly good for ACL instability and arthritis. If you are feeling a bit lost, start by thinking about what level of support you are looking for from a knee brace. If you aren't sure, have a look at the basic braces and see if they sound about right. If not, move onto the advanced and then the elite level braces. That way you are sure to come across a brace that is right for you. Where knee braces come in more than one size, it is important to get the right one otherwise they won’t work effectively and may be very uncomfortable. If your knee size falls between two sizes, it is usually best to go for the larger size for a better fit. You can find size guides for all the braces we review at the bottom of each page.